In late December 2014 I decided to educate myself in the fourteen numbered Final Fantasy games leading up to Final Fantasy XV’s probable release in 2016. Some I had played and loved, others I had heard great things about and never managed to make time for. Whatever the case, I set out to play those fourteen games to completion in the 2015 calendar year, calling this marathon The Road to Final Fantasy XV in 2015, or the #RoadtoXVin15 for short. While I did not quite meet that ambitious goal, I still stuck with it and gave it one hell of a go, if I do say so myself. To summarize, I successfully completed eleven of the fourteen games in 2015: Every title from Final Fantasy up through Final Fantasy X, then Final Fantasy XII as well. I managed to finished Final Fantasy XIII too, though not until just after the new year hit. I also hit a snag with Final Fantasy XI; a slew of personal obligations that took up much of the month I had purchased a subscription for, combined with the overwhelming learning curve of an MMORPG for a non-MMO player like myself, resulted in my throwing in the towel before even reaching the 10-hour mark. Finally, as it took me until the first few days of 2016 to complete FFXIII, I obviously had no time to even attempt to start Final Fantasy XIV. On the one hand, I’m mildly disappointed that I feel short of my goal. On the other hand, I am immensely satisfied with my own perseverance. Playing primarily a single genre, and more specifically a single series, for an entire year is not an easy undertaking. Thankfully, while the Final Fantasy games shares similar themes (especially early on in the series), they each featured new characters in a fresh world to explore, which helped immensely to keep the fatigue at bay. Still, my accomplishment is no small feat, especially considering my year. I maintained my 40-hour desk job the entire year, while also taking a month-long holiday overseas in the middle of the year. Additionally, and most importantly, I became a father in late November, which pretty much put everything else in my life on hold for several weeks, and obviously still takes priority now. If you consider the time I took off from the Road to XV in ’15 for these events, I actually completed those twelve games in closer to ten and a half months, and would have had ample extra time to play a bit of FFXIV had that time been spent continuing the marathon. That makes me feel a bit better about not reaching that finale. Now enough about all that – let’s take a look back at the year. With each game’s completion I ranked them, from what I believe to be objectively the best to worst games. Some of my ranking placements have been a tad controversial among some of my followers, so allow me to explain my mind set behind it. First off, here’s my final ranking after completing FFXIII. Straightaway, my placement of Final Fantasy XI at the bottom may seem appalling to faithful fans of the MMO from the early days who have stuck with it for more than a decade. Obviously, having only played 10 hours and not even reaching level 20, my opinion on this game is extremely moot and should be swiftly disregarded. I fully accept that. However, I maintain my stance that FFXI, as an MMO, will not (and already does not) stand the test of time for future fans. For a series that began in 1987 that is still going strong nearly 30 years later in 2016, new fans are cropping up all the time. For some, 2009’s Final Fantasy XIII was their first. Others, like myself, entered the RPG world with Final Fantasy VII in 1997. Many players who were introduced to the franchise several titles in have gone back to play some of the earlier games, just like I have done with this marathon. All the main games are still available in their original formats, and nearly all of them have been remade, remastered, or ported to modern platforms in some way, shape, or form. But MMOs aren’t quite the same song and dance. MMOs are updated regularly from their inception, changing bit by bit all the time. No doubt the Final Fantasy XI I attempted to play in 2015 was leagues different from the Final Fantasy XI that launched in 2002. And now, starting this year, two of the three versions on FFXI (on PS2 and Xbox 360) are being shut down, only the PC version left standing. With the final expansion only having released last year, Square Enix is sure to keep it up and running for a couple years yet, but rest assured – in time, the servers will be turned off and Final Fantasy XI will enter the halls of legacy. Fans who join the Final Fantasy franchise in 2030 with the release of Final Fantasy XIX will not be able to go back and play every prior game, because FFXI will cease to be. FFXIV, improved though it may allegedly be from FFXI, will in time suffer the same fate, just as other popular MMOs like World of Warcraft and Guild Wars will too. It’s all just a matter of time. Because of this and this alone, I stand firmly by my (still admittedly uneducated) decision to place Final Fantasy XI at the bottom. Another placement that has ruffled feathers is Final Fantasy VI at the shockingly low spot of number 5, where many would place it at the top, no questions asked. Let’s talk about that, shall we? Before starting this marathon I had never played FFIV, FFV, or FFVI; none of the SNES/Super Famicom-era titles. FFIV and FFVI were always praised up and down by my peers, both casual and professional, yet Final Fantasy V was always overlooked. Considering how much I enjoyed this game (as is evidenced by its bronze medal ranking), the only logical explanation I could come to for it being so overlooked was due to it not releasing stateside on the SNES like FFIV and FFVI were. Many thirty-somethings of today grew up with those classics as children, and so they held a special place in their hearts, much like Final Fantasy VII did (and does) for me. I feel like going into that trilogy with fresh, subjective, blind eyes gave me a better perspective than many victims of nostalgia (says the man who listed Final Fantasy VII in the number two slot when it was his first FF). Now make no mistake, Final Fantasy VI is an excellent game. I thoroughly enjoyed my time with it, and it’s one of just two games in the series I’m really keen to go back to and play again, but on my own time and without a time crunch. It absolutely holds up alongside games today in terms of quality storytelling, lovely sprites, and a truly evil bad guy. Kefka absolutely, hands-down takes the best villain award, most definitely. That said, I had two main problems with Final Fantasy VI that kept it from reaching higher on my list. First, FFVI boasts the largest playable cast of characters in the whole mainline series at a staggering 14 members to choose from. Several are optional and can be skipped over, and those characters have no substance at all. Mog has personality, but no story to tell. Gogo and Umaro have some truly neat, unique abilities, but again offer nothing compelling to the plot. Vincent and Yuffie in FFVII are optional characters as well, but they each have meaningful back-stories and can add interesting dynamics to the game. But Mog, Gogo, and Umaro are completely superfluous. Why even make them playable if the game would be the same without them? My second problem is with the latter half of the game. The World of Ruin is an excellent set piece, and the game gets full marks for making such a drastic change to the world at large that you’ve become so well accustomed to in the first half. However, it seems downright silly that you can complete the game with a paltry three characters. The enormous cast that you had only just gathered all together has now been flung to all corners of the world, and only two of them are mandatory to re-recruit to reach the end-game. Of course many people take the time to track down all the remaining party members (which helps with the final dungeon and battles, having fleshed out parties and all), but so many of the events are just completely optional and missable, which feels kind of wrong, especially once you reach the finale. After defeating Kefka and winning the game, the team makes a daring escape from the crumbling fortress as the credits roll and each character gets a brief focus. But if you didn’t regain that character, their moment plays through without them, making an awkward and confusing scene. I just don’t like it, and it took away from the positive aspects of the game in my eyes. Meanwhile, Final Fantasy V impressed me so much with its compelling story and rag-tag group of just 5 playable characters. With such a significantly smaller cast, FFV gave each of them ample time in the spotlight to become fleshed out, worthwhile characters. Combined with the incredibly improved job system introduced in Final Fantasy III, which allowed for an fantastically deep battle system full of versatility and customization, Final Fantasy V truly shone bright – indeed, brighter than Final Fantasy VI. I’d also like to touch on Final Fantasy X and Final Fantasy VIII, if I may. I played each game when they came out, and for several years FFVIII was in my top three Final Fantasies. At the same time, I didn’t even get halfway through FFX before I threw in the towel. I hated the Sphere Grid, I didn’t care about the story, and I hated Tidus as a lead. While I still really enjoy FFVIII, playing it last year for the first time in at least half a decade, I realized just how mediocre the story with. Though it features several intriguing characters (I still long for the day when Final Fantasy VIII-2: The Laguna Chronicles is announced) and set-pieces (Esthar, the Ragnarok, Garden, etc. ), there are too many “what a twist!” moments that either don’t make sense or come off as lackluster. Then I reached Final Fantasy X, and completed it for the first time, the game absolutely blowing me away for the majority of it. I still didn’t like Tidus, but I appreciated his strained relationship with Jecht and his growth throughout the game a lot more. On my first playthrough I didn’t care at all about Yuna, and this time I took very acute note of how she was the true main character of the game, and her Pilgrimage is a fantastic tale. The love story between the two, while a bit forced at times, still touched me in ways I never anticipated, and that moment at then end where Yuna ran toward Tidus as he faded away – brilliantly crushing. Similar to Final Fantasy V, by then end of the game I cared deeply for all party members present, and the resolution was not “and they all lived happily ever after.” It really, truly surprised me how intensely I enjoy Final Fantasy X, considering I gave up on it back in 2001. Perhaps the most interesting point on my ranking is Final Fantasy IX beating out Final Fantasy VII for the number one spot, considering FFVII remains my overall favorite in the series. The game just does so many things right that it’s hard to find any faults. Literally my only beef with FFIX is how slow the battles move when compared to all games prior, but by the end of the game you’re so used to the speed that you forget it was a complaint in the first place. The clever callbacks to all eight games that came before it; the meaningfulness of crystals being brought back; the colorful cast of characters that is as diverse in gender as it is in species; the genuine, wonderful, natural-feeling love that blossoms not only between Zidane and Garnet, but also Steiner and Dagger; Vivi’s entire overarching story; all of that and more just throws Final Fantasy IX into the top spot so easily. Of course my ranking is by no means definitive. Many of the games I only played for the first time this past year, and due to time constraints I had to rush through them all. Several reasons for enjoying games like Final Fantasy VII and Final Fantasy XII so much in the past are thanks to the numerous side quests, mini-games, and other optional content in the game that’s not relevant to the plot. It’s the padding that often takes a Final Fantasy from a good, passable game to one that excels and really leaves a lasting impression. With the first six games, plus FFX, I had never played them through to completion before, thus I obviously hadn’t had a chance to just sit and grind to the maximum level for fun, or seek out all the hidden summons, or track down the hidden, ultimate weapons. The Battle Square, Chocobo racing and breeding, master materia grinding, and bonus Weapon battles are all extras that I love in FFVII, and I have no idea what kind of hidden goodies there are in FFIV, FFV, or FFVI. Then I know of the Dark Aeon battles in FFX, but of course I had no time to try them on for size. I know my ranking is flawed due to not getting the true experience from each of these games, and accept that many opinions will differ. Still, I feel it’s an adequate ranking given my constraints. Now that I’ve blathered on about the ranking for nearly 2000 words (wow, really? ), let’s move on to some other points. I compiled a fun list of stats and averages from the playtime with each game. But instead of detailing it all in more excruciating words, I have instead drawn it up in a convenient spreadsheet. Have a look. From this information, you’ll see that even though Final Fantasy IV nearly took the longest amount of days to complete, it was incidentally the shortest title of them all at just over 24 hours. Meanwhile, Final Fantasy XII took the honors for most days played as well as longest playtime, clocking in at a staggering 63 and a half hours over 42 days. The first game in the series, Final Fantasy, took the least amount of time in terms of days, as I played it from start to finish in under two weeks. Discounting Final Fantasy XI, as I gave up with my foot barely in the door, the average playtime for the 12 games I beat was 40 hours and 43 minutes. 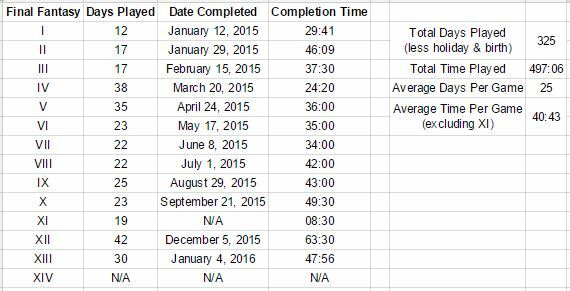 I also spent an average of 25 days playing each game, which is almost bang-on with my original goal of beating each game with 24 days. Not too bad, honestly. And how about that total time played? Yeah, that’s 497 hours and six minutes. That comes out to a grand total of 20 days, 17 hours, and 6 minutes playing Final Fantasy in 2015, not counting the many Game Overs and resulting re-tries. So technically I could have done all this in under a month, had I no job, no social life, and no need for sleep. I do, however, have all of those things, so I’m pretty satisfied with my end result. So now that my year with Final Fantasy is over, what’s next? Well earlier in the year when my buddies Travis and Josh joined me to form the short-lived PoGcast (Travis was marathoning through Mega Man games while Josh tackled The Legend of Zelda), we discussed what other franchises we would be interested in doing the same thing with. We came up with a great list of series that are still going strong today, and while all our lives have gone in different directions since then, the possibility of bringing back the Marathon Men in the future isn’t entirely off the table. It may not happen soon, but the fact remains that it may indeed happen in time. Aside from that, there’s plenty to look forward to with the Final Fantasy name in 2016 alone. First of all, I did in fact obtain Final Fantasy XIV, through the recent Humble Square Enix Bundle, which even came with a one-month free trial. Even though I couldn’t fit it into 2015, I’d still like to have a proper go at it sometime this year. As for new games in the franchise, later this month the 3DS gets Final Fantasy Explorers, with the PlayStation 4 and Vita receiving World of Final Fantasy later in the year. Then of course, there’s the main event: the coveted Final Fantasy XV. March will bring the special event from Square Enix where they will at last reveal the official launch date for the game more than ten years in the making. Many have speculated it will drop in Q4 to make a strong holiday presence, but I’m still pulling for May 8 – ten years to the day since the initial E3 announcement of Final Fantasy Versus XIII. Whatever the date, you can be certain I will be grabbing it on day 1. I won’t live tweet my playthrough like I did with all these games, since it will be new and spoilers are awful, but of course if you want to chat about the game with me you can always hit me up on Twitter at @zacharyplyons. And who knows? Maybe once I’ve beat the game I’ll throw up a bonus #RoadtoXVin15 write-up here chock full of my impressions. Finally, I would be remiss to end this without thanking you, my followers, for your support throughout the year. I have made many new friends and acquaintances in the Final Fantasy community and beyond throughout this marathon, and all the conversations, new follows, shares, and encouragement I received really helped to push me through and keep going. It helps that I really enjoy the Final Fantasy series, but without support it’s tough to stay motivated on such a journey. Most importantly, I want to thank my wife who doesn’t much care for Final Fantasy for putting up with more than 365 days of this nonsense, and also acting as my spot-check editor. So yes, I would like to thank each and every one of you who has checked out my silly little marathon, and I truly hope you have enjoyed traveling The Road to Final Fantasy XV in 2015 with me. < The Save/Continue Podcast – Episode 17: Now With Your Daily Recommended Dose of Voice Actor Dave Fennoy!